Inside Llewyn Davis is a film that washes over its audience; it has such tenderness that it sinks in slowly, with the same bittersweet melancholy as its songs. It tells the tale of an itinerant folk singer as he wanders through Greenwich Village in the hazy, harsh light of the winter of '61. 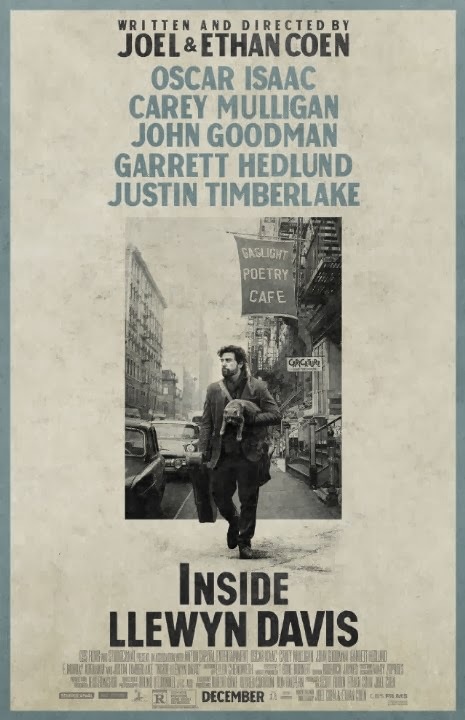 Llewyn, huddled agains the cold, spends his time looking for a breakthrough, a new record producer, a place to stay, some cash...and so the film meanders, moving in an odd circular pattern as seemingly uncertain as its titular hero. Llewyn hitches a ride to Chicago at one point, along with an eccentric old jazz musician in the form of John Goodman, and his Dean Moriarty-esque valet. It's a quiet nod to the Beat Generation, but the strange collection of travelers vanish as quickly as they appear; anecdotal figures on a road to nowhere. It is the film's ultimate slightness that has made it ripe to be ignored through awards season. Oscar Isaac's un-showy, achingly sad performance does nothing hyperbolic enough to earn him loud praise. The Coen Brothers have always created worlds for their characters to inhabit; they have a penchant for beautifully heightened artificiality. Here, their choice of colour palette - all pale pastels and browns - is highly evocative of the period, poetic without ever feeling unduly drenched in nostalgia or sign-post reference points. With a taste for authentic mid-century architecture and design, few films set in such an iconic cultural period so comfortably capture the feel of an era without anachronism. As for Llewyn, he is a knockabout in life's whirlwind, and a screw-up of the highest order; selfish, petulant, sarcastic, and worst of all -- arrogant. He hides behind a shuffling, unassuming persona, but can't completely smother the smug glint in his eye. Yet he remains likable almost in spite of himself; downtrodden in the freezing New York winter, pushing his luck with all his friends, droll in spite of his circumstances. We've all been failures, we've all been screw-ups, and like Llewyn, mostly because we were too blind or self-serving or unlucky to help ourselves. The surprise comes with how much, in all his disheveled glory and self-sabotage, it becomes so easy to sympathise with him. Crucially, when he opens his mouth to sing, you can't help but to be wooed. The fantastic quality of the music is a vital element of the film, and falls into place with the natural talents of those involved, overseen by producer T Bone Burnett. In many ways, Inside Llewyn Davis has the feel of a great song; it takes some time to appreciate all its nuances, but it's easy to love. It's a film that charts the ambitions, failures, and ultimate frustrations of creative life - of the struggling artists who make up the toiling majority. It does so with lyricism, humour, and tenderness. Llewyn and his yellow cat (s?) become instant iconography in The Coens' body of work. He is representative of the loser in all of us, and of our unshakable belief that the loser contains more brilliance than the world will ever get to know.